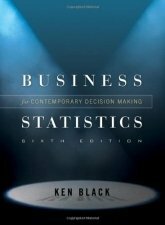 can have trouble recognizing the importance of studying statistics, and making connections between concepts.Ken Black's fifth edition of Business Statistics: For Contemporary Decision Making helps students see the big picture of the business statistics course by giving clearer paths to learn and choose the right techniques.Here's how Ken Black helps students see the big picture:Video Tutorials-In these video clips, Ken Black provides students with extra learning assistance on key difficult topics. Available in WileyPLUS.Tree Taxonomy Diagram-Tree Taxonomy Diagram for Unit 3 further illustrates the connection between topics and helps students pick the correct technique to use to solve problems.New Organization-The Fifth Edition is reorganized into four units, which will help professor teach and students see the connection between topics.WileyPLUS-WileyPLUS (not included with this edition) provides everything needed to create an environment where students can reach their full potential and experience the exhilaration of academic success. In addition to a complete online text, online homework, and instant feedback, WileyPLUS offers additional Practice Problems that give students the opportunity to apply their knowledge, and Decision Dilemma Interactive Cases that provide real-world decision-making scenarios.Learn more at www.wiley.co,/college/wileyplus.